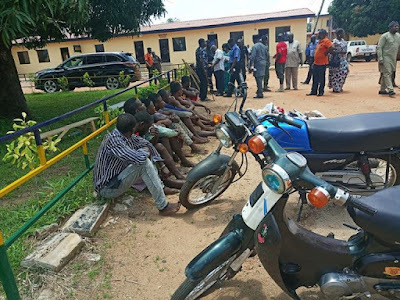 The Benue State Command has paraded armed robbery suspects and other criminal elements who were arrested in the past two weeks. FSARS Operatives on 14/09/2018 at about 2000hrs, while on patrol in Otukpo town arrested one Hon. Joseph Egbe who claimed to be a Vigilantee leader of No. 6 Rice mill road Otukpo, with one fabricated Single barrel revolver gun. On interrogation, he opened up to source of the gun and led to the arrest of one Austin Elaigwu of Otukpo town, further investigation led to the recovery of three (3) additional arms and the arrest of Austine Enejo. SUSPECTS; Abah Dedon Kena, Aldous Amabo, Obono Ubi, Ibor Bassey and Obeten Sunday. EXHIBITS: Three hundred and Seventy Eight (378) ammunition of various caliber, a telescope two (2) knives and assorted charms. On 18/09/2018 at about 2300hrs, Operation Zenda Operatives on stop and search along Adikpo-Ugbema road intercepted the following persons: Abah Dedon Kena, Alfous Amabo, Obono, Ibor Bassey and Obeten Sunday in a black Toyota Camry car with Reg. No. FST 51 AR LAGOS. Upon search, the following items were recovered: three hundred and seventy Eight (378) live ammunition of various caliber, a telescope, two (2) knives and assorted charms. Investigation is ongoing. EXHIBIT: One locally made pistol. Police operatives in Gboko on 22/09/2018 at about 1200hrs, while on patrol responded to a distress call and arrested one Terungwa Tyowua 25yrs with a locally made pistol. The suspect was trying to rob a female victim of her belonging she she raised alarm which attracted the police patrol team and the young man was arrested. ARREST OF ARMED ROBBERY SUSPECTS, RECOVERY OF ARMS AND A STOLEN MOTORCYCLE. On 21/09/2018 at about 2100hrs, Operation Zenda Operatives while on patrol intercepted one Aondowase Yese and Terhide Iorsase both of Ugbema in Buruku LGA with two (2) locally made pistols, two (2) live cartridges and one (1) Honda Motorcycle. 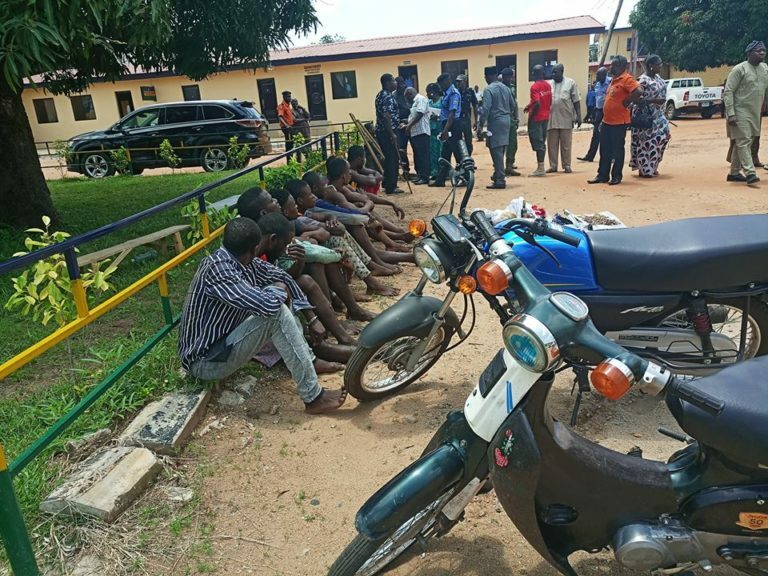 The suspects confessed to have snatched the said motorcycle from a motorcyclist on gun point along Ugbema-Jato Aka road. All suspects would be charge to court as soon as investigation is concluded. Meanwhile, the Commissioner of Police assures the good people of the state, of the Command’s renewed resolve to ensure that crime is brought to its barest minimum.